There’s no question that a boat hoist is the best solution for keeping your watercraft protected while also making your waterfront lifestyle in Surf City, North Carolina, as enjoyable as possible. With your boat stored at your waterfront property, spending a day out on the water is as convenient as possible. And, because your boat will be stored above the waterline when not in use, you won’t have to worry about damaging saltwater corrosion, organism growth, and other costly problems. Unfortunately, a standard boat lift isn’t suited to all waterfront properties, such as narrow canals and other areas where pilings can’t be used. Fortunately, DECO Boat Lifts can solve this problem by installing a boat elevator instead. 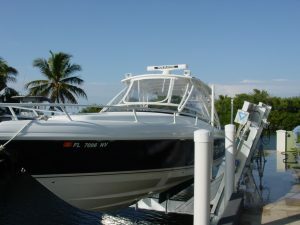 Unlike standard boat lifts, a boat elevator can be mounted directly to the seawall or to a single set of pilings, making it perfect for tricky docking scenarios. And, when you choose an elevator lift from DECO Boat Lifts, you can rest assured it will provide exceptionally reliable performance. We offer two distinct drives for our boat elevators to suit our customers’ unique needs and budgets. For example, our Maxi Lift is a highly affordable, entry-level option that doesn’t sacrifice performance. With a heavy-duty aluminum flat plate drive system, this lift is capable of hoisting a wide range of watercraft. If you’d like a boat elevator that is loaded with the industry’s most advanced technology, our Concept CRS Lift is the best choice. Not only does this lift have a direct drive to achieve incredible power without the use of belts, pulleys, or chains, but it also comes standard with our patented Cable Retention System (CRS), which prevents destructive cable overlapping and spooling. To learn more about the benefits of turning to DECO Boat Lifts for a boat elevator for your property in Surf City, NC, contact us today.